Unisonの秘密は、Apollo Twin USBのマイクプリアンプと内蔵のUAD-2　DUO Core DSPアクセラレーターによるハードウェアとソフトウェアの統合です。Unisonプリアンプ・プラグインをマイク・インプットに接続するだけで、世界中でもっとも多くレコーディングに使用されたマイクプリアンプのサウンドを手に入れることができます。. As good as it gets - the UA quality! This interface is just fantastic! And I'm writing this review coming from another very high-end audio unit which has been replaced without any regrets. I've been using UAD plugins for years (PCIe cards) and I was expecting only the best. This is what I got with Apollo USB and then some. Integration with my existing UA hardware is perfect and it worked straight out of the box without any problem. Pros: Excellent word-class converters, Unison preamp technology (WOW! ), Console software, stability and well-thought unit controls. Great job, UA! 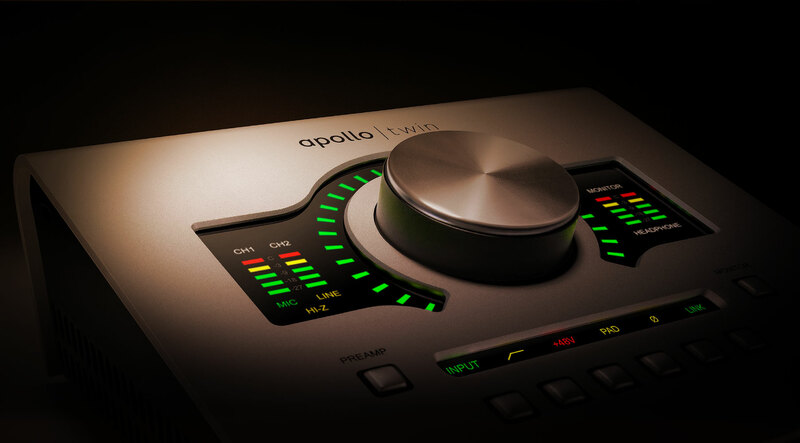 It was well worth waiting for Apollo Twin Duo USB few months! Les convertisseurs sont très bons. Les préamp unison (neve 1073, ampli guitare) améliorent vraiment la qualité des prises. Tout est bien fait dans cette carte son y compris et surtout le workflow. On se met en condition de faire un bon enregistrement très rapidement. Le console recall permet de retrouver les réglages utilisés en cas de besoin. L'ergonomie est vraiment bien faite avec tous les réglages de gain et de monitoring via le gros bouton. C'est un plaisir à utiliser. I have had it for 2 days and I am thinking of tossing out my Apollo 16 firewire 800. Because it is USB3 (laughs) it responds to Windows’ sleep mode. You can unplug the Twin, power off, or light your PC on fire. As soon as you reconnect, in any order your grandma wants, the settings from Console update the Twin with no iffs or butts. I even unplugged the Twin and took it to my Studio PC with different plugs in console and it was like having Sunday Lunch. The same cannot be said for freakin’ Firewire Apollos and Satellites, where your PC is on all day, or suffer the consequences…!.. As an audio interface, I'd give it a 4 star. Latency is about as good as Apogee, but behind Audient. Better than the Clarett though. The look and feel of the things is a bit different than other interfaces. I like the BIG BUTTON thought. When it starts, the clicking and LED checks scare me, but I guess it's a very good thing they've implemented cause it's searching for physical problems is my guess. I've been through a LOT of audio interfaces and what makes this 5 star really are the Pre-amp plugins. The Neve in particular. I wish this unit were a QUAD though. The DSP's get used fast, so you have to bake plugins or add a Satellite. Mix Control software is superb! random buzz, cut audio, blue screen. Here everyday life since I changed my Presonus 44VSL by USB appolo. The tips of the support changed nothing. And I've been waiting over a week the response of the technical service. There ought to be a Quad version of the Twin, or an Apollo 8 for USB 3. I have had UAD SHARCS for over a decade and am tired of always having to bow to CEO Tim Cook first. USB 3 boasts 5.6gb per second burst rates! Screw Thunderwire and Firebolt! They never catch on, not even with Zeus! Obsolete UAD firewire 800 devices run from a PCIe slot, which they recommend is not suited for the USB3 Twin. I've had nothing but problems with the unit I received. I disconnected it and do not plan to use it again. Das Interface ist der Hammer !!!!!! Klasse Sound , super Plugins schon in der Grundausstattung dabei. Kaufempfehlung Nr 1 . Es uno de los juguetes mas divertidos que he tenido en estos ultimos años! This is the best audio interface that I have ever used. Setup was super simple, the free plugins were an amazing extra bonus, and I now have zero latency recording ability at my finger tips. I paired the Apollo Twin USB 3.0 with some KRK 5 Gen 4s and let me tell you!!! My recordings into Reason 10 sound amazing and combined with Universal Audio's mixing suite and plugins, I am set to make some amazing songs. This audio interface was one of the best recommendations that I have ever received. Thank you for taking the time to this hardware with true quality, it really shows!! If you are reading this and haven't bought this yet, stop reading and purchase it. I give this product 5 out of 5 stars. I love my usb twin. I love it because of the complete control I feel when mixing. Also the plugin bundle it comes with is great. Sometimes what I do with my mixes, I will run my mix through the twin and use UAD plugins on the signal and print back into my DAW. It is such a great Interface. I sold my Focusrite 2i2 as soon as I bought it. Very compact interface and very useful to use in your desk. One of the things I like more is the big control to turn up and down the volume of your monitors or headphones. Very easy and accesible controls in the keypad so you can select inputs and ouptups and monitorize it with one button. The plugins are really incredible. Very easy to use and very high qulity sound. This unit is capable to run many of the plugins without having porcess trouble so if you are thinking in buying a bigger interface because of precessing I think it is not necessary. This model has only 2 mic / line inputs, 2 line outputs and 2 monitor outputs. Even you have 1 high Z input very useful to record directly instruments. I use 8 inputs more from another interface Motu 896MKII through ADAT connection and it works perfectly on 48 Khz frequency. This little box brings the sound of the studio into your home! I absolutely love this audio interface. I've been doing freelance voice over for nearly 8 years and this is by far the best decision I've made. I sold a few things to afford it, but boy was it worth it! The Unison preamps are amazing. With the $50 off and sale, I got the Neve Unison preamp for $50 and boy is it gorgeous in all the right ways. I definitely recommend this, it's an amazing piece of kit! I absolutely adore this unit. I recently upgraded from an Audient iD14, and while it's a significant price increase, it's also a decent quality increase too! 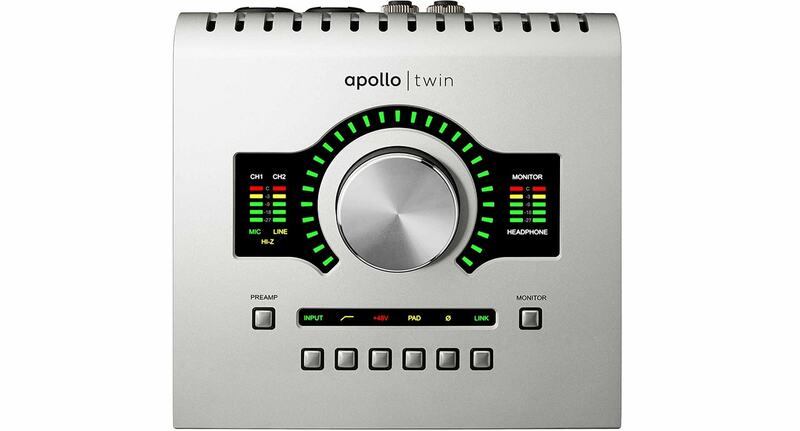 This Apollo Twin USB is a solid step up into the world of audio recording and offers powerful and fast tools for the home-recording artist. The unit does get a little warm, so be sure to keep it in an open area (on top of your desk should be fine) away from other heat sources. Make sure you look at the recommended system requirements too, as this little beast needs a lot of power from your machine to really give you the best bang for your buck! Overall, this little box brings the sound of the studio into your home! What can I say........the sound quality is amazing,seem's very sturdy and tough.The included UAD plugins are just the best.5 out of 5 stars! This device is useless if you don`t provide a new driver package which is compatible with windows. The second computer is also not running properly. The USB Twin costs almost 800€!!!! Please support us with a solution which is working!